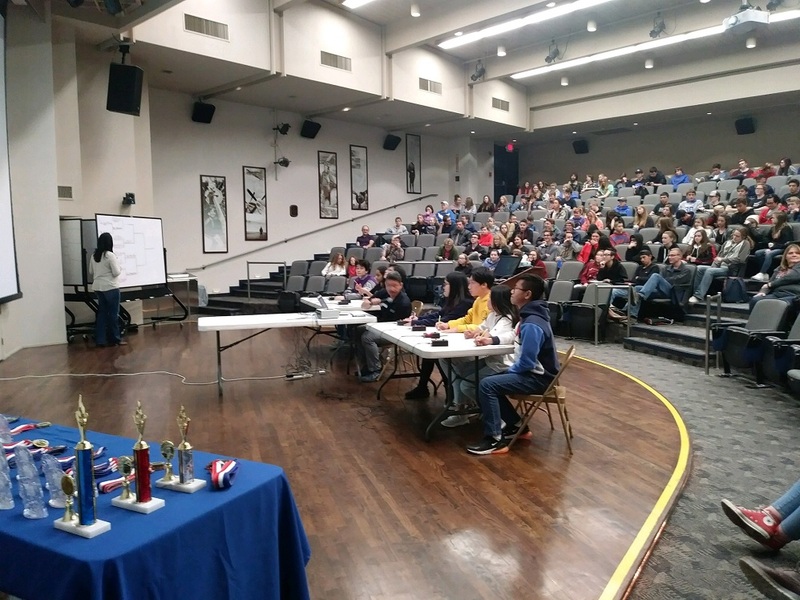 Last week, mathematics faculty Stephen Wolfe and his Mathletes team scored huge wins at the Yavapai County Math Championship held at Embry-Riddle Aeronautical University. The first event was the team competition where Orme took 1st and 2nd Place along with a rarely seen perfect 50 score. There were nine schools and 200 contestants competing that day. In the individual competition, Orme once again took the top two spots (Ngoc – 1st Place and Quan – 2nd Place), while three other Orme students (Steve, Naomi and Hoang) finished in the Top Ten. The final challenge of the championship was the “Face Off” between the best teams from each school in a Jeopardy-style format. Normally the Face Off competition is somewhat long as once a question is put up on screen the two teams have several minutes to calculate and agree upon an answer before hitting the buzzer to respond. However, Orme’s very own Naomi went through all three rounds pushing the buzzer within a couple of seconds, and answering every question (except two) correctly. Mathletes coach Wolfe stated, “Naomi responded to the questions sometimes before I had even finished reading them!” As a result of Naomi’s speed and accuracy, Orme won the Face Off competition, too. Congratulations to our incredible Mathletes! Well done!